When you have the occasion to visit the prints and drawings section of an art museum you will be struck by the low intensity of the light used to illuminate the artworks. Compared to the rest of the collection, the scene is virtually spectral. While the oil paintings will inevitably be lit with a mixture of natural and electric light, drawings and other works on paper will, on the other hand, be illuminated with very low wattage bulbs. This is to prevent the colours fading, a big problem with similar works of art. There is an additional problem when you need to mount and protect Andy Warhol serigraphs. Light fastness is an important subject in the field of fabrics testing, however, the author is at present unfamiliar with scientific research on the lightfastness of Warhol’s silk-screens or the lightfastness of serigraphs in general. In other words, we do not know how long they will last before they begin to fade. Another problem is the large format of these Warhol serigraph works of art. In most art museums, watercolours, etchings, prints and other works on paper are circulated at regular intervals. That is, they are hung on the walls of the museum for a limited period before being returned to storage to be replaced by similar works for visitors’ enjoyment. Art museums rotate works of art on paper at regular intervals to prevent them being damaged by ultraviolet light (UV). Drawings, etchings, woodcuts, lithographs, watercolours and, of course, serigraphs on paper, parchment, vellum and silk are very susceptible to this hazard. The colours in the paintings will fade and the cellulose structure of the paper support degrade, leading to the deterioration of the artwork in the presence of UV, especially from sunlight. Indoor lighting by tungsten bulbs and fluorescent tubes are another source of harmful ultra violet radiation. However, the small format of most watercolours etchings and similar works makes them easy to store: it is a little more difficult with the large size of Andy Warhols. Renaissance painting, Birth of Venus by Sandro Botticelli, 1482. Having chosen the style of frame it is important to glaze - shield with glass - the painting by choosing a protection policy that reduces as much as possible the bad effects of UV light. You can choose natural glass itself of a type fabricated to incorporate a UV blocker. This gives the painting maximum visibility. Its drawbacks is its expense, it is difficult to obtain, cracks or breaks easily to create glass shards that cause serious damage to the painting surface, especially to a large format Warhol serigraph. Alternatives for glazing are acrylic resin-based glass. These are: ACRYLITE OP3 sheets developed for picture framing with ultraviolet filtering incorporated. It, apparently, will filter out the greater part of damaging ultraviolet ray spectrum. Another commercial glazing option is Optium Acrylic Glazing made for the museum community. From Tru Vue, McCook, Illinois USA, it includes conservation grade UV Protection anti-reflective safety glass and UV filtering. Also available, Plexiglas UF-3 sheet. 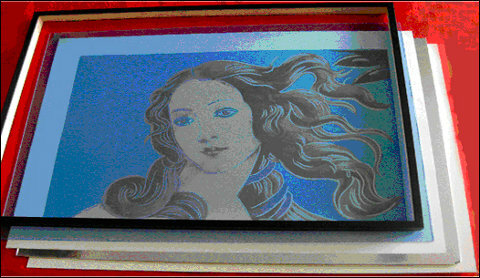 Plexiglas MC UF-5 sheet is a standard as a glazing medium for the high UV safeguard of works of art. It does exhibit a slight yellow tint making it less suitable in some ambients. Plexiglas UF-4 sheet is sometimes chosen as an alternative by museums and private collections for this reason. We should, however, protect also our serigraph’s paint surface from coming in contact with the glass by isolating it with a mounting board, known as a passé-partout. Direct or too close contact with the protecting glazing often creates a static condition where microscopic flakes of paint will be lifted from the paint surface or cause dew to form on the inside of the glass by a form of osmosis. The frame maker will provide the passé-partout with a bevelled window cut into the surface to reveal the work of art. You will need to use mounting board of a quality known as 4-ply ‘museum board’ with a 100% solid cotton core. Why is this important? The printed surface of your serigraph will be in direct contact with the board: its cotton-fibre structure will be expected to protect the serigraph from contamination not guaranteed by less expensive mounts. It will have a neutral pH or buffered by an alkali added to prevent the damage caused by acidity attacking the work of art. In the prints and drawing section of the British Museum where, at one part of his career, the author worked on the conservation of old master drawings, cotton-based rag mat boards are used for mounting, storing and exhibiting their precious paper-based treasures. We have put our silkscreen into its frame, protected with specially prepared anti-UV glass, and mounted the artwork behind its pH neutral window mount. Your framer will place the framed, glazed and board mounted painting face down on a padded work table in order to add an acid-free backmount: its purpose is to support the back of the serigraph in the frame, avoiding contact with air-borne agents deleterious to the serigraph and to prevent it coming in direct contact with the wall where it hangs. Be aware that the back of the painting, being out of sight, framers do have a tendency to use non-conservation quality materials in this part of the framing process. However, pH neutral foam boards for backing paper works of art, tested to reach museum conservation levels are available. Thicker foam core is recommended for backing larger format works of art on paper. This backboard is rigid, and lightweight, of archival quality and gives better support for larger artworks. The board should have an acid free foam interior, the surface papers be high quality alpha-cellulose virgin pulp, white on both sides, lignin-free, not recycled, and of archival quality. Some boards known to meet these requirements are, Greyboard, Art Cor, Conservatek Board and Klug. In some cases, a further margin of protection can be provided by interposing, between the back of the work of art and the backboard, a sheet of polyester film or aluminium foil. This falls into the belt-and-braces category of safety and protection. 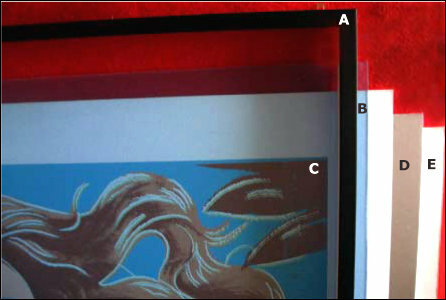 The non-printed back of your silkscreen art work should not be attached to the backboard with two-sided adhesive tape. These chemically unstable tapes deteriorate, are difficult to remove not to mention the dark stains they leave on the artwork. Amongst the methods currently in use by conservation-aware framers and paper restorers for attaching and taping, are rice flour starch paste applied to Japanese-type paper hinges. Specially prepared hinges with similar water-based bonding agents include cotton based archival adhesive tape. There are discussions in the art museum conservation world as to the benefits of sealing the back of the frame in order to defend the work of art from dust, other atmospheric contamination and insects. Having carried out framing procedures that adhere to generally accepted conservation standards you can seal the back of the frame, using frame-makers tacks subsequently covered with conservation quality acid-free paper tape. Conservation framing of Andy Warhol serigraph. Detail showing, from top, the different sections of the framing. (a) Picture frame, 4.5 x 2 cm. black lacquer matt. (c) Work of art, with transparent spacers to hold the painting away from contact with the ‘glazing’. lying against back of the Warhol. Developed by, Isonova srl, Volpiano,Turin. However, hermetically sealing a work of art on paper into the frame, to create a sealed environment, may produce a glasshouse effects. Fresh air will be unable to circulate. The sealed-in ambient between the glazing and the backboard produces a stagnant atmosphere and natural humidity can, over time, encourage the growth of micro organisms such as bacteria. Eventually, the result will be the growth of mould leading to the unsightly splotches on the face of the painting called foxing. Another menace is the alteration of the painting’s colours and to the paper on which the work of art was created. Most museums prefer a simple and safe method to insert, hold and easily remove watercolours and etchings from their frames. This is accomplished by means of spring clips called tournettes; the better quality are spring loaded and fixed to the frame with screws. To address the problem of atmospheric pollution, museum conservators may sometimes cover the back of the frame with fine rayon gauze, fixed on with tape or brass staples. The procedure will block dust and insects but still allow the circulation of fresh air. This gauze is often, in fact, of the type that Andy Warhol himself would have used. 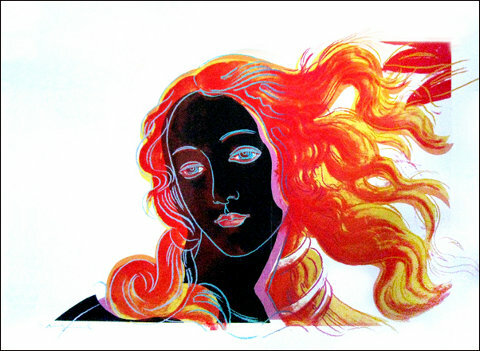 In his case he attached it to the frame of his silk-screening press to which he or his technicians, during the creation and printing of Botticelli’s Venus, applied his colour pigments. Screenprint on Arches Aquarelle (Cold Pressed) paper.1984, 81.28 cm x 111.76 cm., image size 63.5 x 93.98 centimetres. One of a portfolio of 4. Edition 17 of 70, 18AP, 5 PP, 5HC, signed and numbered in pencil lower left. There are several TP on Arches 88 paper, Printer: Rupert Jasen Smith, New York. Publisher: Editions Schellmann & Klüser, Munich, Germany / New York. Degradation of cream-coloured mounting board, the result of prolonged exposure to sunlight. The gradual deterioration of the board is moving noticeable from left to right where the cream colour surface moves through to a manila-board ochre. Serigraph printing is also known as silkscreen. A fine silk gauze, now replaced by a polyester material, is attached to a timber frame on to which the artist attaches his design or painting with various types of stencils. The artist places the framed mesh, face down, in direct contact with the paper he is printing on and forces a coloured paint or an ink through the mesh with a roller or a squeegee on to the paper surface where it leaves an image. In order to obtain a print of more than one colour, he replaces the stencil with a differed section of his design and adds another colour. Andy Warhol’s works are an example of the good results obtained when a creative artist uses silkscreening. The use of artists pigments in an acrylic or similar medium with suitable additional compounds to make them fit for using in serigraphs - rather than ink-based colours - will increase their lightfastness to the level of watercolours or other mediums on paper. As they are normally much larger, the board or paper the colours are screen-printed onto require, however, additional protection against direct sunlight. Tournettes are spring-loaded plated clips that are screwed into the back of the timber frame. The spring lightly presses the tongue element against the back of the glazing-to-backboard package of which the work of art forms part. You will require four or more of these accessories depending on the work of art’s dimensions. Simpler chromed steel frame clips are likewise screwed to the back of the frame. Their spring-like nature gently presses against the back of the support, holding it in place.